As the brake shoes and drum wear it may become necessary to adjust the rear brakes on your Honda CB125E. They may also require adjustment after tensioning the drive chain and will most certainly need adjustment if you need to remove the rear wheel. There are two points of adjustment on the CB125E. There is a stopper bolt on the brake pedal that allows you to adjust the pedal height. This adjustment is provided for the comfort of the rider. If the brake pedal height is too high the rider may need to lift up their foot to operate the brake, this may be a problem in an emergency stop. If the brake pedal height is too low the rider may find it difficult to operate the brake properly. Generally once the brake pedal height is set to the riders preference it will not need any further adjustment. The other brake adjustment is the amount of freeplay in the pedal between the brake being at rest and when it starts to take hold when the brake is applied. This distance is perhaps a little arbitrary as some riders may prefer more or less freeplay. If there is not enough freeplay the brakes will be partially applied even when the brake pedal is not pressed. This will worsen as the brake get hot and expand. If there is too much freeplay the rider may not be able to fully apply the brakes. The specified freeplay is 20-30mm (0.8-1.2in). Adjusting the brake pedal height is an easy job that will take only a few minutes to complete. 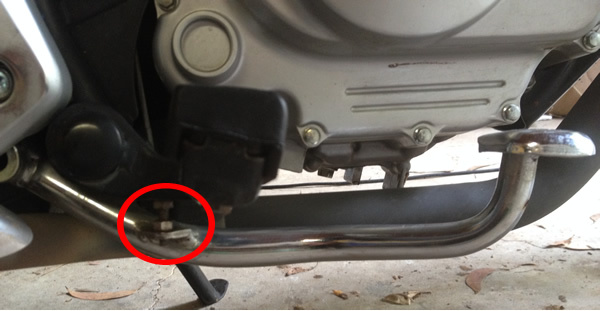 The stopper bolt circled in the above image is provided to allow the rider to adjust the brake pedal height to their liking. Loosening the locknut and turning the stopper bolt clockwise will raise the pedal height. Turning the stopper bolt anti-clockwise will lower the pedal height. Once you are satisfied with the brake pedal height dont forget to tighten the lock nut. Adjusting the brake pedal height will affect the amount of freeplay so the brake should then be adjusted as described below. Adjusting the rear brake will only take a few minutes but will ensure that the brakes will operate at their best when you need them. What you are effectively adjusting is the amount of freeplay in the pedal, how far the pedal must be moved before the brake starts to apply. Start by placing the motorcycle on its center stand so the rear wheel can be rotated freely by hand. Rotate the rear wheel and apply the brake pedal until the brakes start to take hold, measuring the distance that the pedal moves at its end (where you put your toes). This distance should be 20-30mm (0.8-1.2in). 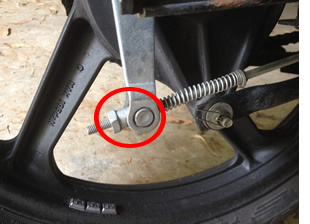 If the brake requires adjustment turn the adjusting nut on the end of the brake rod (circled) half a turn at a time until the correct amount of freeplay is achieved. Notice that the nut is shaped so that it sits against the brake arm pin? Make sure that it is sitting correctly when you measure the freeplay in the pedal. Apply the brake a few times and rotate the rear wheel a couple of times to make sure that the brake is not binding. Your brake should now be adjusted and the bike ready to ride.